No matter what school they are attending, many business students across Canada are learning the fundamentals of business from professors with the University of New Brunswick’s faculty of business administration. Three of the top selling textbooks in business schools cross Canada are written by UNB business professors. Professor Dorothy DuPlessis teaches business law and her text book, Canadian Business and the Law, now in its 6th edition (the 7th will be published in 2019), is a leading business law text in Canada.This text offers a unique, risk management approach to studying business law. “One of the things students like about this text is that rather than focusing on legal rules and principles,” DuPlessis explained, “it focuses on how business people should manage the risks created by the law and legal system.” Another unique feature about this text is that it is not a “Canadianization” of a successful American textbook, rather it is a grounds-up, wholly Canadian product serving the needs of Canadian students and businesses. Canadian Business and the Law is published by Nelson Education and is co-authored with Shannon O’Byrne, Philip King, Lorrie Adams and Steven Enman. Fundamentals of Corporate Finance, published by McGraw-Hill Ryerson, a finance text book authored by Dr. Devashis Mitra, Dean of the faculty and professor of finance, ranks second in sales across Canada among the textbooks in its category. His co-authors have been Richard Brealey, Stewart Myers, Alan Marcus, Elizabeth Maynes. The 5th edition of this text has sold out and is now in its 6th edition. William Lim, a former finance professor with UNB’s faculty of business administration, who now teaches at the School of Administrative Studies at York University, is a new co-author of the newest edition. 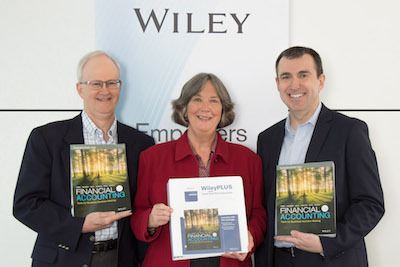 Professor Emerita Barbara Trenholm is one of the Canadian authors of Financial Accounting: Tools for Business Decision-Making, now in its seventh edition by Wiley and used in schools across Canada. Ranked as the number one selling accounting text in the country, students say it helps them understand the purpose and use of financial accounting, whether they plan to become accountants or whether they simply need it for their personal life or future career. The text is paired with an online teaching and learning environment, WileyPLUS with ORION, and offers students a practical set of tools for use in making business decisions based on financial information. Trenholm’s Canadian co-authors are Wayne Irvine of the University of Calgary and Chris Burnley of Vancouver Island University. A first-time contributor to the text with this edition, Burnley is an award-winning teacher at Vancouver Island University who completed his BBA at UNB in 1988 at the faculty of business administration. While he was a student here, he took accounting courses with Trenholm. “This contribution of our professors is another way UNB is making a significant difference across the country to business education, of which we are very proud,” said Dr. Gopalan Srinivasan, Acting Associate Dean of Research and Graduate Studies and finance professor. For more information, contact Liz Lemon-Mitchell with UNB’s faculty of business administration. Learn more about our business programs. Photo: Barbara Trehnholm (centre) with co-authors Wayne Irvine (University of Calgary) on her right and Chris Burnley (Vancouver Island University) on her left.